Dr. Neeshat Khan is a Board Certified dentist who serves residents living in the San Jose, California area. At Neeshat Khan, DDS, patients are able to receive services in both periodontics and orthodontics. Periodontic care involves the maintenance of the gums and the soft tissues of the mouth. A few of the most common procedures involved in periodontics includes biopsies, crown lengthening, treatment options for canine exposure, occlusal adjustments, periodontal splinting, cosmetic periodontal surgery, scaling and root planing, osseous grafting and surgery, and the treatment of periodontic gum disease. Maintenance of the gum tissues goes much further than just being checked out at the yearly dental exam. The gums must be cared for between visits, just like the teeth. It is important to carefully check the gums each time the teeth are brushed to ensure there are no abnormalities. When is Soft Tissue Grafting Needed? Soft tissue grafting may be needed if an illness or injury damages the gum tissue enough that the roots of the teeth are exposed. This may also occur as a result of the aging process. As the gums recede, the roots of the teeth may start to appear above the gum line. When this occurs, the teeth may become loose or fall out completely. To prevent this from happening, a soft tissue graft may be used to restore the gum line back to its normal height. This stabilizes the teeth and helps to hold them in place. 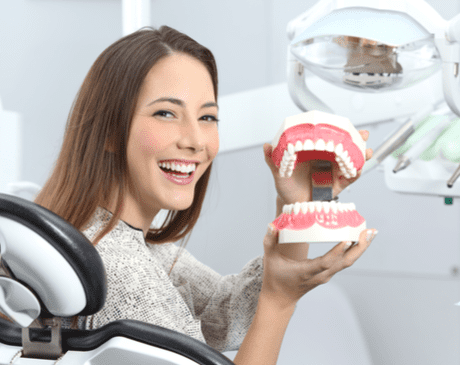 In situations where the jaw has become severely damaged due to an accident bone grafting may also be needed to restore proper structure and form to the jaw. A frenum is a band of tissue in the mouth that connects to structures. There are two located within the mouth. The first goes from the palate, through the two front teeth and upwards into the gum line. The second attaches the tongue to the floor of the mouth. When these two frena (plural of frenum) become too large, they can impact a person's speech patterns and affects how the mouth functions as a whole. A frenectomy is a surgical procedure that involves the removal of the band of tissue restoring proper form and function to the mouth. In most cases, this procedure can be performed in the dentist's office using a local anesthetic.